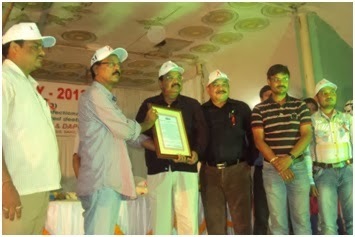 One the eve of World AIDS Day2013 a sensitization programme was organized at Angul Jail on 1st Dec.-20123 under the Chairmanship of ADMO (P.H) In the same sensitization Workshop DPM (DAPCU), ICTC Supervisor, & Counselor of JSPL ) joined as resource person. DPM (DAPCU) discussed about the basics of HIV/AIDS, ICTC Supervisor discussed on Stigma & discrimination and JSPL counselor discussed on HIV/AIDS & Human Rights) At the end of the programme . IEC materials was distributed among the prisoners. The sensitization programme was highly appreciated by the Jail authority. 30 Nos. of Colorful stickers with HIV/AIDS message was branded in the backside of Auto Rickshaws at DHH, Angul, . The Sub collector Angul first inaugurated the same by Branding the same on AUTO Rickshaw at DHH, Angul on 01.12.2013. These Auto Rickshaws also participated in the Mass Awareness Rally. Silence Road Show was organized in front of Sabhaghar, Angul on 01.12.2013 . 30 Nos. of Red Ribbon Club member of different college with HIV/AIDS Message stand in front of the Sabhaghar and disseminated the message on HIV/AIDS. Colour full gate and Banner with World AIDS Day message has been arranged in Stategic places like Shabhaghar, Traffic Chhak, PTC Chhak, Harimohiri Chhak & Rail Way Station . Three TI partner in collaboration with DAPCU, Angul organized one condom distribution stall at DHH, Angul and distributed condom to General Public. On the occasion of World AIDS Day-2013 one Voluntary Blood Donation Camp was organized at Pedipathar, Athamallik and 44 Blood units were collected. Before starting of the Blood Donation Camp a HIV/AIDS awareness Rally was organized in the same village. To boost up the World AIDS Day Campaign, a mass awareness rally was organized by Zilla Swasthya Samiti Angul in Collaboration with DAPCU, TI Partners, Corporate Sector, PLHIV Network. 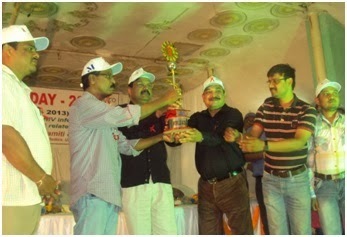 The Rally was inaugurated by the Sub Collector, Angul. More than 700 participants like Red Ribbon Club Members, NSS, NCC volunteers, ASHA, Anganwadi workers, NGO personnel, PLHIVs, FSW, MSM, Migrant labour, Truckers and Auto drivers, College students, Govt. Officials etc. joined in the Rally by using Red Ribbon, Caps, with message on HIV/AIDs. The rally was lead by Central School students with biting Drums Again three TI partner also lead the rally with HIV/ AIDS related slogan by using Microphone The rally went round the major road of Angul with placard and Banner as well as with slogans on HIV/AIDS. The most attractive features of the Rally were MSM participants with colorful dress with slogans on HIV/AIDS lead the rally which attracts the Public. The press & electronic media personnel taken the photograph of the Rally and the same news was published and telecasted. Finally the rally reached at Sabhaghar at 10.30 Am. 30 numbers of AUTO Rickshaw rally with HIV /AIDS message branding at the left & Right side of Auto Rickshaw started from DHH Angul & cover PTC Chak, Turanga & reach at Sabha ghar at 10.30 A.M.
100 numbers of Yuba Sakti member joined in the Motor Cyale Rally by using Red Ribbon , Caps, placard with message on HIV/AIDs. The rally went round the major road of Angul with placard as well as with slogans on HIV/AIDS. For the observation of World AIDS Day-2013 rally and public meetings were organized in all CHC and the ICTC Counselors of concerned CHC take the lead for the same Programme & joined as a chief speaker in their concerned Block level meeting. What are few challenges faced by you and how did you overcome it? The drama staged by the MSM CBO and the Rally lead by them was highly appreciated by the public. This year the World AIDs Day-2013 was not only observed by ZSS, Angul but maximum colleges where Red Ribbon Clubs is functioning were observed the same day. Besides colleges, various organizations like Rotary Club, Pollution Control Board, Hero Motors different NGOs also observed the same day Even all the corporate & Private sector observe the same Day with high enthusiasm. The Programme was highly appreciated by the public.